How do you picture climate change? Do an online image search for the term, and you’ll see a familiar but narrow spectrum of iconography. Earth’s blue and green beauty juxtaposed against fiery orange and desolate brown. Smokestacks belching plumes into the sky. Lean polar bears adrift on ice floes. The symbolic images gesture at causes to stop and effects to fear, but the process itself seems harder to capture. Ann Arbor artist, activist, and adventurer Leslie Sobel, 57, helps others understand what it’s like to be in the middle of climate change by making what she describes as “wilderness based science-inspired art.” With her deep commitment and talent, she conveys experiences that may be too remote or too slowly occurring for most to access directly. To create her most recent solo exhibition, she traveled last year to the Eclipse Ice Field in Kluane National Park, in northern Canada’s Yukon Territory near the border of Alaska. As a crowdfunded artist-in-residence she joined a team of climate scientists led by professors Karl Kreutz and Seth Campbell, who use ice core chemistry, geophysics, and modeling to study glacier systems and Earth’s climate history. Leslie and the researchers braved challenging environments as they camped and worked on the icefield to understand climate change and climate history. Before she could take off on the last leg of her travel from Michigan to the icefield, a fierce wind blew the door off the tiny two-passenger airplane. Once there, camp duties included digging a fresh latrine in snowpack every few days—no small task in bitter cold and the thin air of a 10,000 foot altitude. Though the summer sun was up for 19 hours each day, temperatures dropped as low as 30 degrees below zero Fahrenheit. Bundled in many layers and two sleeping bags with a hot water bottle, Leslie slept with her camera batteries next to her body to keep them from freezing. While the researchers gathered ice samples and examined the glacier using radar, Leslie asked questions, took photographs, and journaled. Sometimes, conditions precluded outdoor work, and the crew bided time near the heat of a small stove in their shared kitchen tent. With her passion for the environment, Leslie values the Ecology Center’s work to protect it and the people who live in it. 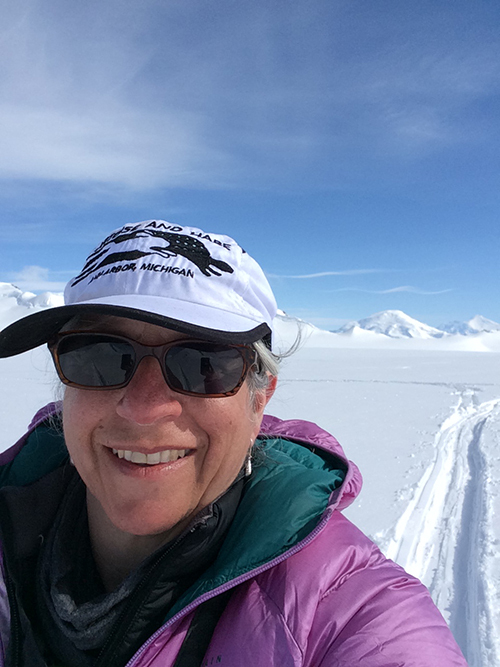 She enthuses, “I am grateful for the work the Ecology Center does - we need it!” She’s been intermittently active as a supporter for many years and has brought her socially engaged art to fellow supporters long before her trip to the Kluane. In 2010, she organized artists and created sustainable centerpieces for the Ecology Center’s annual dinner and 40th anniversary celebration, featuring a keynote by Van Jones, a titan in advocacy for green jobs and a sustainable economy. We’re grateful for Leslie’s work, too. Global warming’s diverse and dispersed effects can make the phenomenon seem abstract. When the difference between 71 and 73 degrees on your home’s thermostat feels minor, it’s difficult viscerally to grasp the profound influence of global temperature changes of a couple degrees, even when you know the facts. Geological and climatological shifts may occur across tens of thousands of years, and even comparatively sudden changes take many years or decades of observation to become clearly visible. Some of the more dramatic and tangible effects occur in remote and challenging polar landscapes, where glaciers melt and rivers change course, sometimes rapidly. Though Arctic and Antarctic ecosystems represent some of the loudest metaphorical canaries chirping warning for the state of Earth’s biosphere, most people never have the chance to see such places in person. Even fewer will be able to witness the process of changes there over time. Leslie’s approach creatively engages nature, science, and culture, and she plans to continue crossing boundaries. She’s gone back to grad school for an MFA in a part-remote, part-residential interdisciplinary program focused on art, ecology and systems thinking at the University of Hartford, and she’s excited about where it’s taking her artistically. Reading her reflections on her work and seeing the many forms her climate commitment has taken in her nontraditional artistic career, it’s impossible to miss that she’s a woman on a mission. She’s clearsighted about what that mission is. As she describes on her website: “To make art about climate I need to experience it, be in it and see what we are losing as we do a variety of highly unhealthy things to the planet.” Leslie strives to understand what’s precious and at risk in the world because of climate change, and she works to convey value and share her experiences with others. For those who want to see Leslie Sobel’s work firsthand, it’s currently on display at Gallery 117 at the Ann Arbor Art Center, Terra Gallery in Dublin, OH, and Sleeping Bear Gallery in Empire, MI. She also has a solo show titled Icefield Memories upcoming this fall at the Jewish Community Center of Greater Ann Arbor. The JCC exhibition's opening reception will be Sunday Oct 28 from 4-6pm, featuring an artist’s talk by Leslie, and the show will be up through November. You can also learn more about her work, see pictures of shifting terrain, and read more about her travels in the Yukon on Leslie’s website, on her blog, “painting with fire,” and in this piece she wrote for ProWax Journal.